I have a studio to die for. It is located upstairs over the garage with high ceilings and a ton of natural light along with multiple spotlights for great light during the nighttime hours. My long arm, sewing area, cutting area, design wall and fabric storage is located in the main room and I have a loft area next to it for my office area. There is a toilet located right off the sewing room, so I really never have to leave unless I get hungry. I suppose I could put a fridge and microwave in there, but it is nice to experience the rest of the house at times. 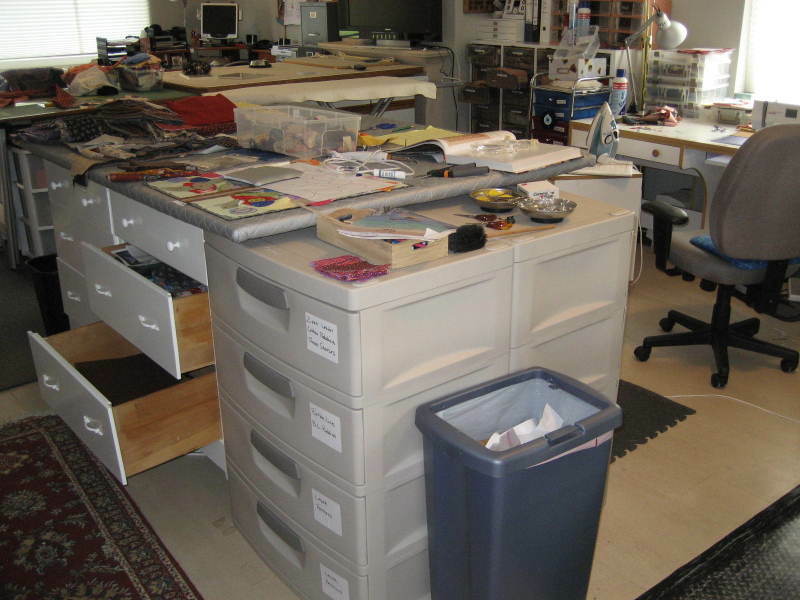 THERE IS A PLACE FOR EVERYTHING AND IT IS A BEAUTIFUL ROOM TO ENHANCE CREATIVITY. Last week was such a busy week, I didn't lift a needle. However, I did purchase a new home in KINNELON, New Jersey and prepared our condominium in New Jersey for sale to go on the market next weekend. I arrived back to Brussels this morning and my life is now officially a whirlwind. The packers are coming in 2 1/2 week and I will be on the plane to return to New Jersey on August 1 with Abbey, the dog, in tow. 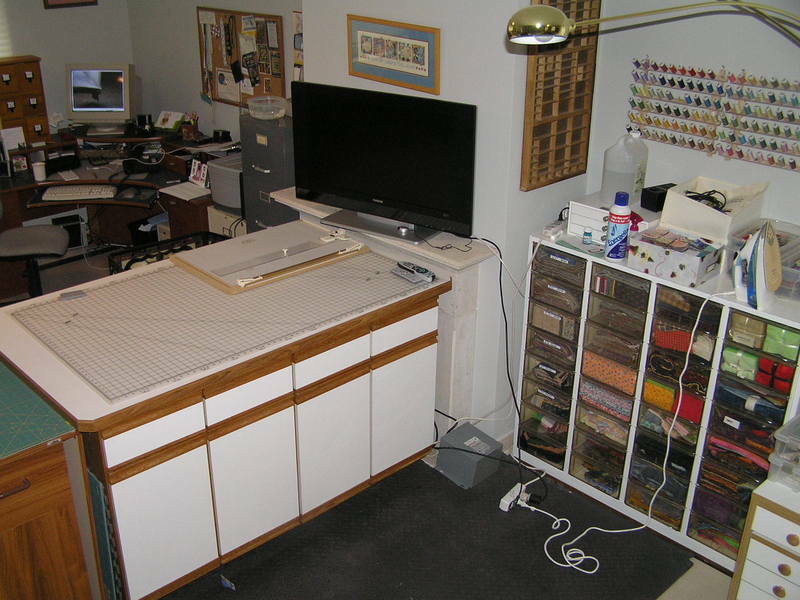 I thought I would forward you pictures of my new sewing studio so that you can all drool. It is a great room above the garage in the new house. I can't wait!!! These individual Nearly Insane blocks, Dear Jane blocks and Civil War blocks make for some horrendous messes in the sewing room. I keep dragging more and more fabrics out of their places looking for the perfect fabric for the blocks. I had such a huge mess in here and it continued to get bigger after this photo. I had to clean if up for the last session of the kids quilting class. They put on their bindings yesterday by machine and they will do the other side by machine when they get home. 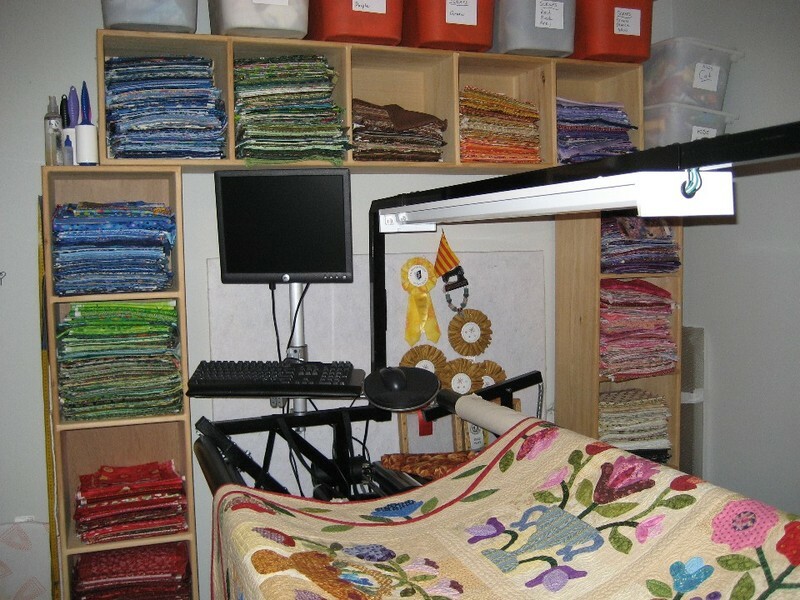 I would like to start by showing you my quilting/sewing room. It is the entire living room of the house and I am afraid to say that it is a bit too small. Who would have dreamed that a room 18 feet by 36 feet (650 square feet) would be 'too small'. Either I need a bigger place or less 'junk'. I vote, bigger space, as I don't think I can part with any of the 'junk'. My stash is of grand proportions. I have all of my fabrics less than 1/2 yard on the exposed wood shelves near the long arm. 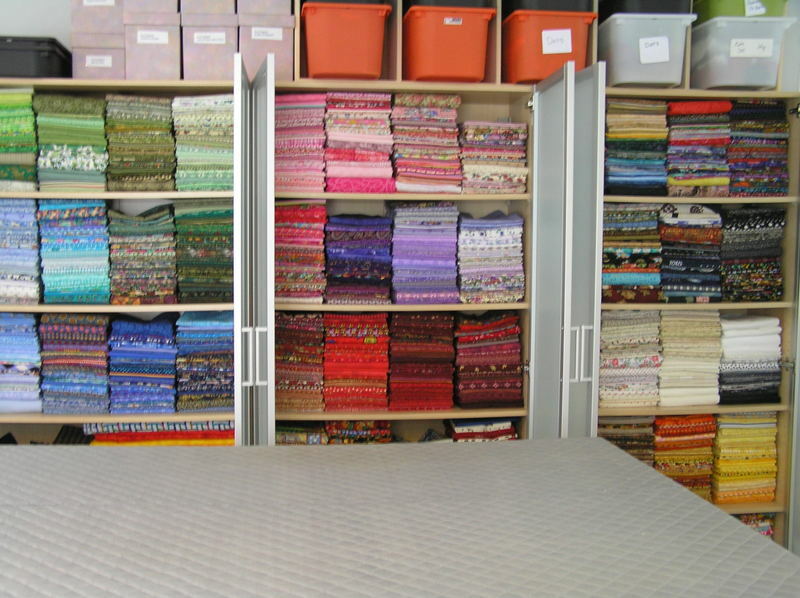 I have my three IKEA cupboards filled with my fabrics greater than 1/2 yard cuts. I had a friend give me an old commercial bra cabinet with 32 drawers where I have my strips cut into many different widths. It is extremely ugly, but I might say it is effective. 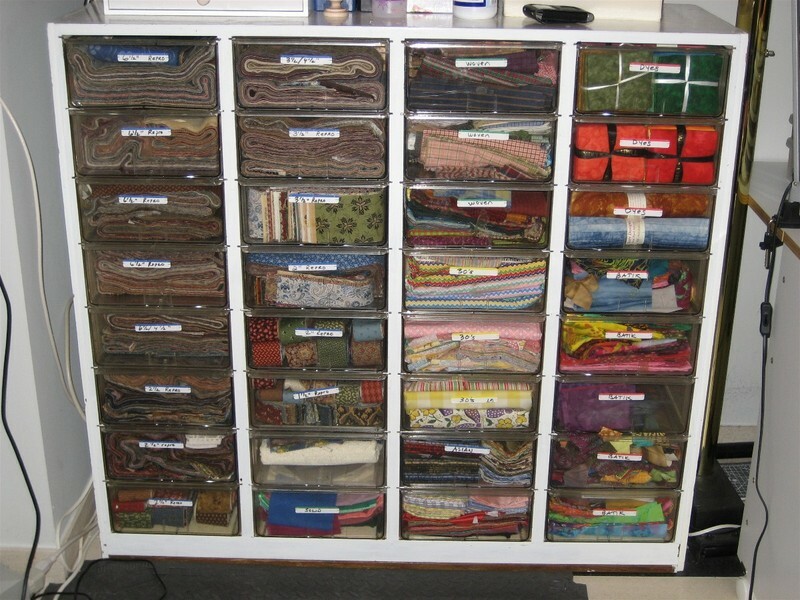 I have spent a lot of time here in Belgium perfecting the organization of the stash. 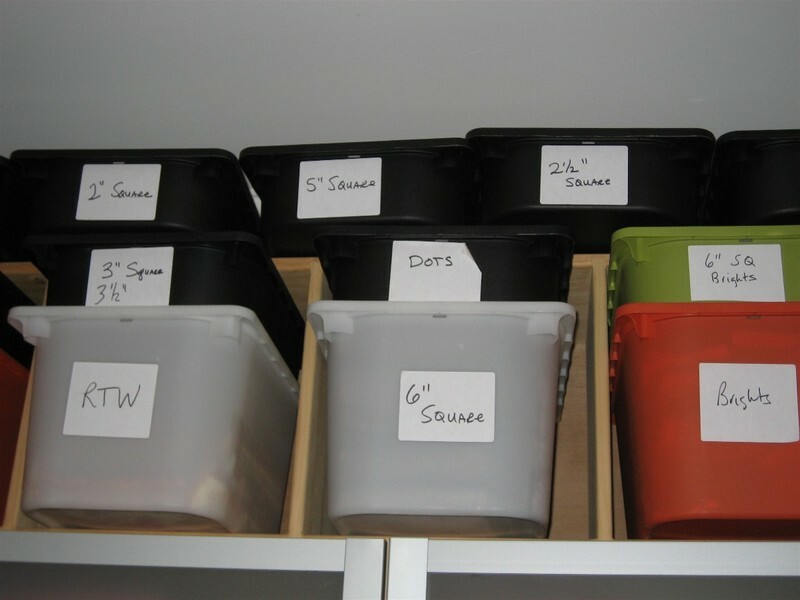 I also have IKEA bins to keep small scraps organized into colors. All in all, I am sure that I will never use all of this fabric in my lifetime or that of my children. I guess I take stock in the old saying "the one who dies with the most fabric, wins". I have been trying to use up my stash, but I must admit, I have added more these past two years than I have eliminated. One step forward, two steps back. However, now that I have a decent collection of repro's and 30's, I think I can slow down significantly.